Due to holiday get together and parties, I find myself using more makeup than usual. Sometimes after a long night, I became a little lazy and skipped my usual make-up removal routine. As result, my skin showed signs of my laziness. A few years ago, I learned washing my face with cleansing soap foam was not enough to remove daily built-up from make-up, skincare products and sunblock. Imagine, many of these products are waterproof so simple soap and water aren't going to do much good. Instead it is important to use good makeup remover to rid all the stuff on the face before washing with gentle soap. 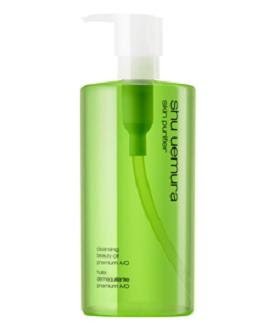 After many testings, my favorite is Shu Uemura Skin Purifier Cleansing Beauty Oil with tea tree extract. I usually buy the large size which is $72 but there are smaller sizes starting at $12 at Sephora if you just want to try it out. This oil base cleanser is the no. 1 selling product for the company and I understand why. This is a 2 in 1 product which removes and cleans the face. I love the organic scent and the fresh feel of my skin after each application. If I just use La Mer cleansing gel, I can still feel something on my face afterward. I use waterproof sunblock daily so simple water and soap do not suffice. Technically there is no need to use additional cleansing agent after this but I will follow up with La Mer cleansing gel to get to extra clean feeling. What is your favorite/secret makeup remover that works wonders? I was at a friend's bathroom the other night and was surprised at the sorry state of her makeup brushes. For a woman who took so much care with her skin, those brushes looked like they could really do with a good rinse. I clean my brushes almost on weekly basis. Even though my brushes don't roll in dirt but oil from my face and general exposure to the environment may allow bacterias to grow. Also it only takes minutes to clean. I generally clean all the brushes with gentle facial cleansing soap and rinse with warm water. What about you, how often do you clean your makeup brushes? This is an excellent reminder that we need to keep our beauty tools clean - I wash them every 2-3 weeks, since I don't wear powder/shadow everyday. But cleaning them helps with the application as well! And the bottle looks pretty too, which is always a plus! You've come to the rescue with your savvy makeup tips! Thanks a lot! I clean my brushes once a week too. You are right, we need to really know what we're doing or it gets worse instead of better. I have heard nothing but wonderful things about the Shu cleanser, I think it's time to give it a try! Happy Holidays Savvy Girl! This is a great post!! A lot of girls don't realize how important it is to remove makeup daily and clean makeup brushes. I honestly don't wear a lot of makeup, but when I do I generally use soap and water afterward. I am definitely going to have to try this remover you reviewed. It looks a lot better for my skin! Thanks for sharing this review, it sounds a great product to try!! I wash them with a Sephora brush shampoo once a week. I used to be really bad about this! I haden't heard of this clenser. It sounds like a great product! I use Clinique Take The Day Off Makeup Remover for Lids, Lashes & Lips, then a makeup remover facial towelette, and finally my Boscia face wash.
As for makeup brushes, I use a spray cleaner after each usage. I wash my brushes with Bare Escentuals brush shampoo every month. Eek... I don't wash mine as much as you do, but at least I try to give them a gentle cleasing once in a while (when I remember), right? I don't clean my brushes as often as I should too. Shu Uemura cleansin oil is really good. I use it too. Happy holiday SG. I actually clean mine every other day. I can't stand the possibility that bacteria could get onto my face from simple makeup brushes. I clean mine about once in 2 weeks, but I don't use them daily. so I guess that's ok? good enough right? i try to clean my brushes every sunday...i can see it in my skin if i don't! umm i really don't clean my makeup brushes often, but now that you've said BACTERIA i'm going to rethink my ways. you've just inspired me to be a better person. haha. And thanks for the review on the makeup remover, i've been looking for a good product like that! Unfortunately, I am one of those guilty women who have terrible brushes. I am way overdue in replacing them. I am neurotic about cleaning my brushes. I have to do them weekly or else I feel like I'll break out! I clean my brushes weekly too. And I love the Shu oil! :) I am like you. I follow up with a cleanser to make sure it is really clean. You are lucky to have it part of your date nights. The hubs likes musicals more than ballets. When I initially mentioned the Nutcracker, he said "Anything with the words 'nut' and 'crack' make me nervous"....hahaha! You have reminded me that I must clean my brushes. also i think changing hair brushes is important too. i just changed my brush recently (i wont admit how long i had been using my prior one!!) and i have to say it is a night and day difference in my hair!!!! I clean my brushes every 1-2 wks. It depends on how much I have been using them. Anytime I get a zit, I definitely clean them. I wash them with Softsoap and then spray them with Japonesque brush cleaner as a finish.